The Commission on Professional Credentialing welcomed Chief Todd Canale, CFO, as a Commissioner representing the Department of Defense. The CPSE Board of Directors unanimously approved his appointment. Todd Canale is the chief, fire emergency services, for the Davis-Monthan Air Force Base in Arizona, an accredited agency through the Commission on Fire Accreditation International (CFAI). In addition to overseeing all activities of the fire department, Chief Canale serves in the Air Force Reserve as a Liaison Officer providing Air Force oversight for the Southwest Region of the Civil Air Patrol, and teaches both fire science and leadership courses at Pima Community College. 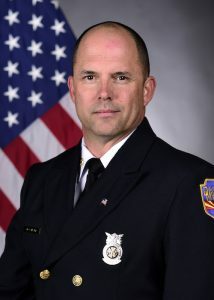 Chief Canale is a graduate of Arizona State University with a master’s degree in Fire Service Administration, is currently a doctoral candidate in Organizational Leadership at Grand Canyon University and is a graduate of the National Fire Academy’s Executive Fire Officer Program. He earned his Chief Fire Officer designation in 2011. Learn more about the individuals that graciously volunteer their time to overseeing the Credentialing process.